“What do you mean?” I asked, having no idea who she was talking about. Back then, before I’d spent much time with my Bible, hearing that Scripture contradicted what I’d learned as a convert was alarming. So that night, I got out my Bible and looked up the passages my friend had pointed to as evidence Jesus was simply the first child born into a large Catholic family. The most frequent verses she cited referred to Jesus as having “brothers” and “sisters.” Not only that, she said, but Matthew 1:26 said Joseph didn’t know Mary (in the Biblical sense) until she had her “firstborn son.” The implication being, of course, that you don’t refer to a firstborn unless there’s more than one. In time, I learned that most Protestants today believe as my Baptist friend does: that Mary, while a virgin until Jesus was born, lived an essentially normal married life with Joseph after the birth, making the Catholic claim that she was a “perpetual virgin” for her entire life almost laughable. Lot is called Abraham’s “brother” in Genesis 14, though as the son of Haran, Abraham’s brother, he was actually Abraham’s nephew. Jacob is called the “brother” of his uncle Laban in Genesis 29. Kish and Eleazar were the sons of Mahli. Kish had sons of his own, but Eleazar had no sons, only daughters, who married their “brethren,” the sons of Kish. These “brethren” were really their cousins (1 Chronicles 23:21–22). There were good reasons that the words brother and sister had such wide meaning among the Hebrews. To begin, neither Hebrew nor Aramaic has a specific word for “cousin.” To refer to a cousin, Jesus would have had to say “the son of my mother’s brother.” But such descriptions are clumsy, so the Jews often used the word brother for brevity’s sake. To determine the relationship of someone referred to as a brother, sister, or a group of “brethren,” you have to look at the context of the Scriptures, as we see above with the example of Lot. Even beyond semantic and linguistic arguments, however, we don’t find even reasonable evidence in the Bible that Mary had any children other than Jesus. In fact, all the evidence points to him being her ONLY child. Nowhere in the passage describing Mary and Joseph finding Jesus in the temple is there even a vague hint of them having other children. Notice that both Mary and Joseph went looking for Jesus. If they had had other children–other, younger children–it’s hard to imagine both parents would have left all their children to go off searching for their oldest. As any couple with several children can tell you, “divide and conquer” means one parent (usually Mom) stays home with the little ones while the other (usually Dad) goes to look for the errant ‘tween. More evidence that Jesus was the only child of Mary is that the people of Nazareth referred to him as “the son of Mary” in Mark 6:3, not as “a son of Mary.” In fact, others in the Gospels are never referred to as Mary’s sons, not even when they are called Jesus’ brothers. If they were in fact her sons, it’s strange they were never mentioned in connection with her the same way Jesus is. But we find Jesus’ “brethren” saying to him in John 7:3-4 that Galilee was no place for him and that he should go to Judea so he could make a name for himself. Another time, in Mark 3:21, they sought to restrain him for his own benefit. This behavior only makes sense if these “brethren” were older than Jesus, but that eliminates them as his biological brothers, since Jesus was Mary’s “firstborn” son (Luke 2:7). Finally, consider what happened at the foot of the cross. When he was dying, Jesus entrusted his mother to the apostle John (John 19). The Gospels mention four of his “brethren”: James, Joseph, Simon, and Jude. It’s hard to imagine why Jesus would have disregarded family ties and asked John to care for his mother after his death if these four men were also her sons. Sistas Weekly No. 5 Barack Obama as Lord and Savior Mary, Ever Virgin. Or Was She? 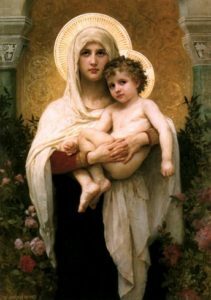 (Part 2) Mary’s Sinlessness and Our Salvation Election 2012 – Where do the Faithful Go from Here?